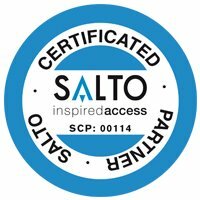 The SALTO Virtual Network (SVN) provides the flexibility for an access control system to grow from a small number of doors and users to a large number of doors and users as required. It allows stand-alone locks to read, receive and write information via an encrypted and secure data-on-card system that utilizes the capabilities of RFID read/write technology. In SVN all access data is stored on and distributed by its operating smart-card. 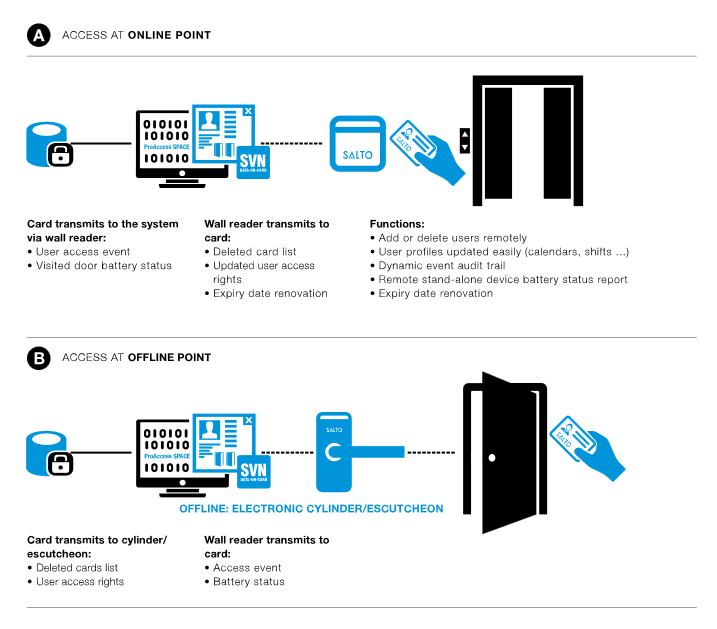 When presenting a smart-card to an offline stand-alone door, not only does this control access rights to that door but thanks to two-way communication, the door also writes data like blacklist information or battery status back to the smart-card. The smart-card then transmits this information back to the server via online wall readers that are able to update and receive information from the cards anytime and anywhere in the building.